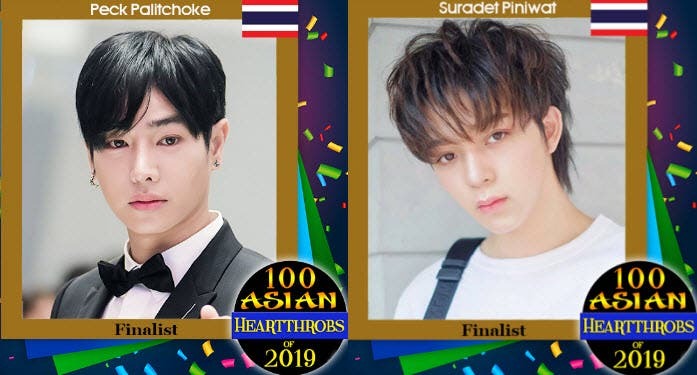 Thai pop star Peck Palitchoke (aka Peck Palit) is currently leading in the Facebook poll of “100 Asian Heartthrobs 2019” the Final Battle with 1,913,527 votes as of 3:30pm of February 12, 2019. Following Peck in second place is his fellow Thai celebrity Suradet Piniwat who got 1,828,315 votes. 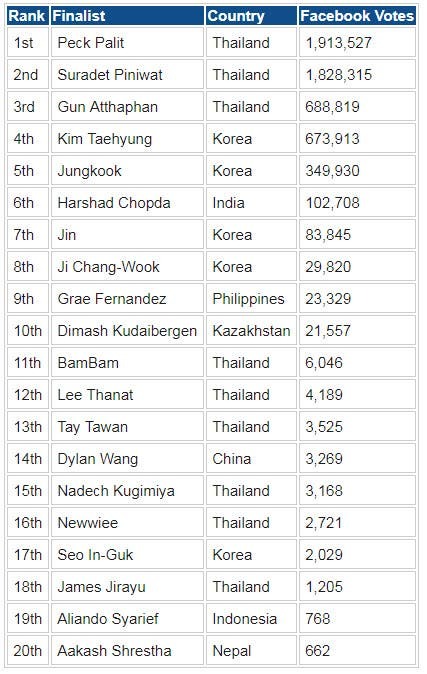 Rounding off the Top 5 are Gun Atthaphan (Thailand), Kim Taehyung (Korea) and Jungkook (Korea). 8 days to go! Continue voting on Facebook. 1. Like and Share the official Facebook photo of a finalist posted on Asian Heartthrobs Facebook page (@asianheartthrobs). The links below will direct you to the official photos. 4. Voting ends at 12:00 noon of February 20, 2019 (HKT/TPE). There is no Spirit of Fairness how is it possible for Kim to get over 1M on FB shouldn’t you be winning around the social media platform how does kim get over 1M on online but is forth in FB and Twitter again up their and IG half of that the number don’t add up so in the Spirit of Fairness everything should be close down and regulate the same way you did the online you should do with FB IG and Twitter or no one should WIN. Não consigo votar no Tae tanto no face como no insta. É uma votação só pra asiáticos? Congratulations to #PeckPalitchoke and #Suradet from Thailand. Why doesn’t match the links ?